One team was already forced to cancel Wednesday's practice. The wildfires currently burning outside of Los Angeles are so large that they can be seen from space, so it's no surprise that they'd have a major impact extending to the area beyond where the flames themselves are doing the most damage. And part of that area includes where the Eagles, staying in California ahead of their second-straight game on the West Coast, are planning to face the Rams on Sunday. Due to poor air quality from the massive fires, which have been fanned by the Santa Ana winds, the Rams were forced to cancel Wednesday's practice at California Lutheran University in Thousand Oaks, according to The Orange County Register. The Eagles' practices, which are taking place further south in Anaheim, aren't expected to be impacted at this time. 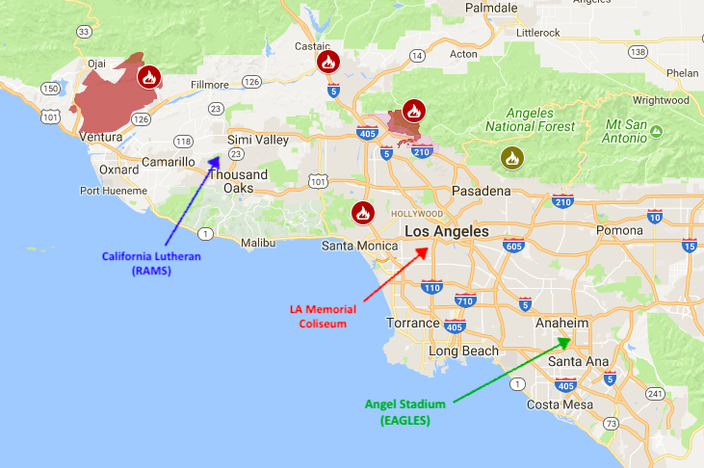 As for Sunday's game, the Los Angeles Memorial Coliseum is located closer to the fires than where the Eagles are practicing, but nowhere near as close as where the Rams practice. Eagles head coach Doug Pederson said on Wednesday that he has not yet heard from the NFL about any contingency plans regarding the possibility of moving Sunday's game. Still, with winds expected to climb on Thursday and increase the threat of fires, especially in the area immediately surrounding the Coliseum, there's no guarantee the game will go off as scheduled. Stay tuned. We'll keep you updated with the latest.